Grimsby Town manager Michael Jolley was pleased with the way his side nullified Northampton as an attacking force during Saturday’s clash at Blundell Park, describing the 0-0 draw as a ‘fair result’. 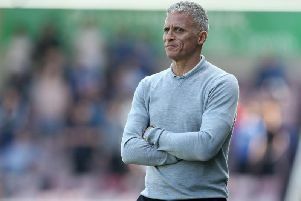 The Mariners headed into the game on a three-match losing run, beaten 4-1 by Tranmere Rovers in midweek, but they stopped the rot on a wind-swept afternoon in Lincolnshire. Northampton have a particular style of play and if ever there’s a day that you don’t want to play against a team who plays in that way then it’s probably when the conditions are like that. Grimsby had a couple of half chances in the first-half but they were penned in by the Cobblers for much of the second 45 minutes, though the visitors too struggled to create clear-cut opportunities. Whilst Town jump back up to 11th in Sky Bet League Two with 52 points, Grimsby are 16th and four points worse off as both teams, now safe from relegation, chase a top-half finish this season. “I think it was a fair result,” said Jolley, whose side have only drawn six games this season, 10 fewer than Northampton. “The conditions made the game extremely difficult for both teams, and it’s not an excuse but it was a fairly poor spectacle overall – the conditions made a big part in that. “Northampton have a particular style of play and if ever there’s a day that you don’t want to play against a team who plays in that way then it’s probably when the conditions are like that. “It made it difficult to get any real rhythm or flow to our game – there were pockets of play from us in the first-half where we were able to connect with each other, move the ball, and try and get in between them. “But the second-half was more difficult because the wind was basically blowing in our direction, so they were able to establish territory, and it became difficult for us to get out because the wind was so strong. “But after three games where we haven’t picked up points – to get a clean sheet and deal with all the balls that were thrown into our box, and to produce some good play in the first-half is something to build on. “Of course from a confidence perspective you don’t want to go too long without picking up points, and we wanted to win the game today, but if you can’t win it you don’t get beaten.